This January my pledge is to cook and eat extra healthy. I have been making sure that I prepare varied lunches for my family with the fresh ingredients. One of my family's most frequent lunch box item is wraps with different types of fillings. The base of my wraps is always a spread or dip of some sort topped with roasted vegetables, salad, grilled haloumi, tofu or mushrooms. The combinations are numerous and you can create a filling for each persons preferences. Hummus is my favorite dip, its really versatile and you can use it as a spread too. I enjoy experimenting by adding new flavors to the basic hummus recipe to create variety. This is how this amazing Pickled Walnut and Avocado Hummus was created. The Opies pickled walnuts are my new discovery, if you have not tried them trust me once you do you will be hooked. I add them to salads, soups, pasta dishes to give the dish texture and a unique pickled flavour too. Drain the chickpeas and reserve liquid. Peel and dice the avocado and drizzle them with a little lemon juice to stop them discolouring. In the food processor, add the drained chickpeas with 4 tablespoons of chickpea liquid. Add the avocado reserving about 1 tablespoon for garnish. Transfer the mixture to a bowl and fold in the chilli flakes. Keep about a tablespoonful of the chopped pickled walnuts for garnish and fold the remaining in. (Do not blend the walnuts in the food processor as the hummus will change colour)Also the chopped walnuts add a nice texture to the smooth hummus. 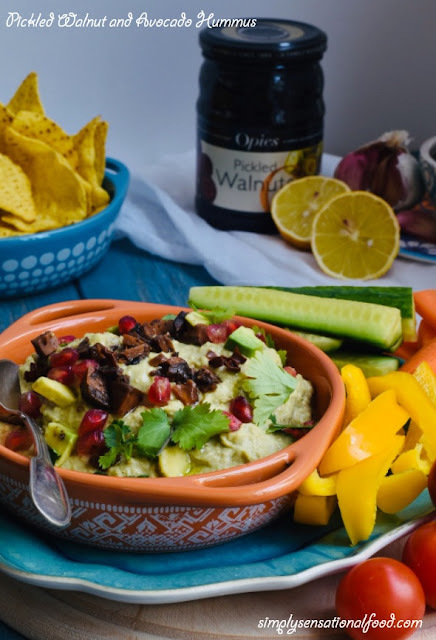 This Pickled Walnut and Avocado Hummus can be served as a dip with vegetable crudites, tortilla chips or used as a spread for sandwiches, wraps and rolls. You can check out some mouthwatering recipes using Opies Products on their recipe page. Looks yummy! Would try out this recipe. I am sure you will enjoy it, do leave feed back here to let me know your thoughts once you have tried it. I'd love to eat the hummus with some tortilla chips for sure! I love how you garnish it and add the drip of oilve oil. It sure is so healthy. Yes we all like to eat with our eyes having food that looks appetising certainly makes the difference. I love this, just fort some avocados yesterday so I am so. Making this. I love them. The avocado really add creminess to the recipe, make sure they are ripe. You will love this combination its really tasty. Ooo what a great flavor. I just love hummus, but I've never tried it like this. I am so going to! You will love it, its become my favorite too. I'd love to try pickled walnuts. I do love the flavour of the walnuts and I'm curious about how they taste pickled. I also love hummus, especially that you can add so many flavours to it. You can get them in most major supermarkets such as Tesco, Waitrose,Ocado and Sainsburys. This looks so delicious and healthy, I will definitely this weekend, can't wait! Will let you know how it goes. Looking forward to your feedback. I am sure you will love it. The walnuts add the extra texture nad the brine from the walnuts do add that slight pickled flavour to the hummus. I'm such a fan of hummus. The flavors in this one really intrigue me. When I was doing a testing recipe my family were a little doubtful but trust me they devoured the bowl in seconds. Its great as a spread on toast or wraps as well as a dip. Pickled walnuts sounds interesting. Your recipe sounds so scrumptious and we are a tortilla family. I love chick peas but I am not a big fan of hummus. I do love baba ganoush so I will give this a try. Wow, this sounds delicious. My wife and I have been on a health kick lately and this is a recipe she will definitely want to try. Thank you for sharing! This looks absolutely delicious! I am a sucker for Avocado anything really and this would be an amazing addition to lunchtime, snacks... really any time of the day! This looks yummy, thanks for the recipe I'm going to try this out. I'd love to make this and we'd most probably use it as a dip. My children are always wanting to try some new dips. They sometimes create their own which does not really look appetizing even if they say it is "yummy." Ooh I love anything with avocados! Looks so yummy. This would make a great recipe for veganuary! I can't wait to try it out! looks so delicious and healthy, i would love to try this dish. Thanks for sharing such an amazing recipe. I am always looking for new ways to making sandwich fillings and this hummus would be perfect especially with the crunchy walnuts. Guess what? I make hummus all the time and this week I made one with chickpeas too and thought...hmmm I need to start making more variations. THIS I will try (and have bookmarked this page) as I am desperate to get walnuts into my kids' diet somehow! Sounds delicious, avocados are one of my favorite things to eat! I need to give this recipe a try, thanks for sharing! Pickled walnut? I think it's new to me. Walnuts and avocados are incredible food as they contain plenty of vitamins and minerals, and it's something that I can't say no to. I need to try pickled walnuts! Adore making hummus and so this must be so good together! Oh wow! I love the look and sound of this! I love avocado, hummus and walnuts. A fantastic combination. Delicious! 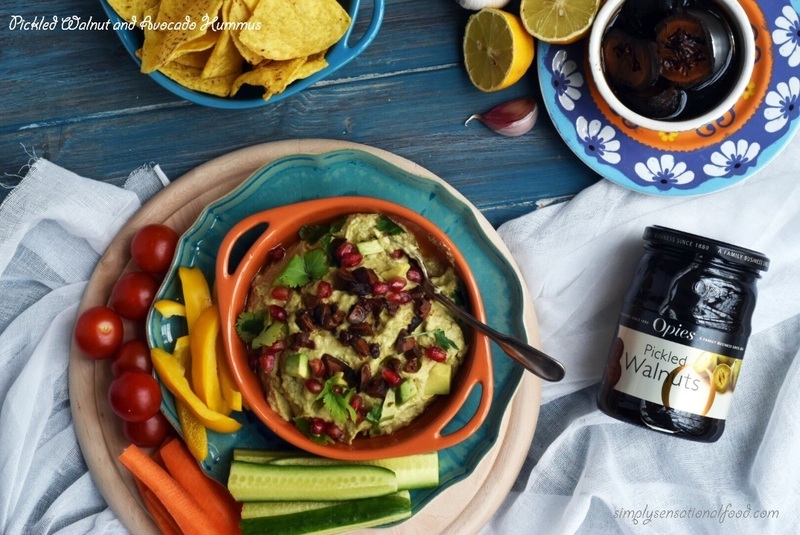 Wow.. this is something worth trying as it is a combination of two favourite dips that we always have .. hummus and avocado. .. and hubby dear loves walnuts too. I love hummus and this is a variant I have to try. It looks so good. I love avaocado and i love hummu so i need try this. thanks!